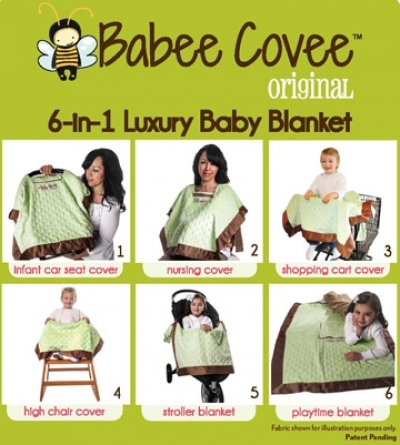 Two moms founded Babee Designs LLC and invented, Babee Covee™ Original (6-in-1 luxury baby blanket) and Babee Covee™ Budee (baby’s multi-use companion). Both products answer parents’ desire for simplicity and fashion at an affordable price. Their products are patent pending, multi-purpose, reversible, machine washable and combine single-purpose baby items into 1! The key message associated with the Babee Designs LLC line is convenience, multipurpose, style and affordability. Most infant and toddler items are single-purpose and purchased individually cost significantly more and take up more space while on the go. The patent pending Babee Covee™ Original and Babee Covee™ Budee reduce the amount of baby gear that parents need to buy and tote and are perfect solutions for today’s busy parents and caretakers.